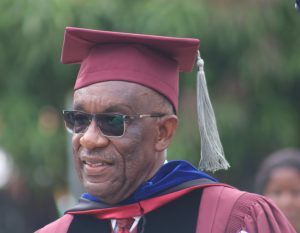 File Photo: Dr. Albert Coleman, President of the United Methodist University of Liberia (UMU). He said part of his plans to drive an excellent academic program will be to hold instructional staff accountable for the full implementation of the university policies. Dr. Coleman indicated that it will be the duty of each staff person to work together to ensure that the rules and regulations of the institution are respected ranging from students’ performance to staff dedication to duty. Quoting from Bishop Quire’s closing sermon on Sunday, February 10, 2019, Dr. Coleman said if the UMU wants to move away from the “old church to the new church” behavior change will be the focus. “We can no longer work as a disjointed unit and still think of ourselves as a team of administrators of the university, he affirmed. “We must respond positively to each other in the implementation of our assigned responsibilities as we lead this institution,” he stressed. Dr. Coleman said there must be a new sense of direction and a new sense of urgency among the administrators, staff, and students of the United Methodist University of Liberia. The UMU President described the university’s Five Years Strategic Plan as the major challenge of his administration, noting, “writing the plan is one thing funding it is another.” He said the university must now reach out to its partners in the United Methodist connection to ensure that the Five Years Strategic Plan is fully implemented for the good of the Liberian people. Prior to his appointment, Dr. Coleman served as Interim President and Vice President for Academic Affairs of the university. Dr. Albert B. Coleman is the fourth in the line of presidents that served the university. His appointment takes immediate effect.